Roy Halladay on Pace to go 49-0. The Phillies have played ten games. Roy Halladay has three wins. It’s a little statistical anomaly thanks to the early season schedule. Halladay will not get 49 starts, and hopefully the Phillies will find a way to scratch out a few more wins without Roy on the mound (as a team they’re on pace for 81-81), but it remains a nice reprieve–these Halladay starts that come every five days. His last two outings, both against fellow NL aces, have been two of the Phillies’ easiest wins of the year. The early season continues to play out in unexpected fashion, but I think this west coast trip came at the perfect time. The collective sighs and groans of 45,000 after every single out can probably take its toll. Ten game trip off to a nice start against the Giants and Tim Lincecum, and the Phils try for their first 3 game rip of the year against Madison Bumgarner tonight. In contrast to Halladay last night was the erratic Tim Lincecum, who is on pace to go 0-32 with a 10.54 ERA. The issue with Lincecum, and with several pitchers around the league seems to be velocity. With the ability to track every pitch down to the tenths of miles per hour, we’ve become obsessed with velocity. If a pitcher drops a couple of MPH, the insinuations that he’s either a) done or b) headed for Tommy John are usually close behind. Sometimes drops in velocity are a sign of arm trouble, but in other cases I think it’s just proof you can’t throw hard forever. 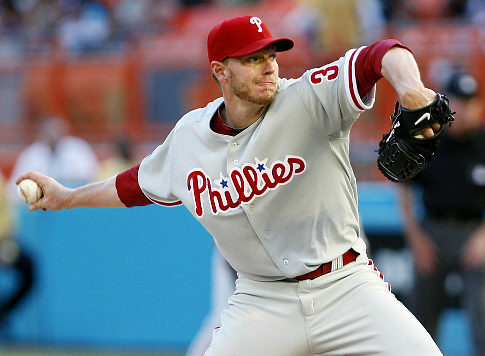 Roy Halladay is also down in terms of fastball velocity, but he’s sporting a sub-1.00 WHIP. He’s still locating. Lincecum was all over the place. If Halladay can be effective at 91 mph, then Lincecum should be able to as well, but Halladay seems far more capable of handling his diminished velocity. Lincecum looks like he’s trying to find those 3-4 mph, and Roy is still making pitches. So if your pitcher’s velocity is down, check his results before you panic. The NFL schedule comes out tonight at 7pm. Only the NFL could turn a schedule release into such an event. Their action appears to be justified, because tonight most NFL fans will trudge through the schedule, offering wins and losses and getting an initial feel for 2012 expectations. What we know now is the list of opponents for each team. That leads to the annual analysis of schedule strength. One fun oddity from this year? The defending Super Bowl Champion Giants have the highest opponents winning percentage. The Patriots have the easiest. What ever happened to “1st Place Schedules?” Before Patriots haters cry foul, the last 4 teams with the easiest schedule missed the playoffs. So tune in at 7 PM tonight to see if ESPN can keep its streak of awful Monday Night games alive. I smell Cleveland/Jacksonville. Sean Payton has essentially been sentenced to football solitary confinement. This isn’t going to be like an MLB manager ejection. Payton will not be able to pull the strings from afar. He’s not allowed any contact with anyone even remotely associated with the Saints or the NFL. If he bumps into someone associated with the Saints at a Starbucks, he has to report it to the league immediately. I’m picturing Payton in a house arrest anklet, looking for new friends on Facebook. It’s kind of amusing. Seriously, does this guy have any contact with people who aren’t involved in the NFL? What’s he going to do with himself? I’d watch out for an incredibly well-coached flag football team in the New Orleans rec leagues. Last night, in the anonymity of the comments section, my “Aces” baseball gambling theory got off the ground. After jinxing Zack Greinke and David Price to what might end up being their worst starts of the season, Justin Verlander shrugged off my “cloak of failure*” and managed to beat the Royals. It got the ledger back to (-125) virtua-dollars. I’m sensing a run coming. A long, long run of sustained and esteemed success. Today’s Pick: Ian Kennedy (-190) over Pittsburgh. Wager 190 to win 100. Since C.C. Sabathia hasn’t quite popped this year, I’ll go with last year’s sneaky NL Cy Young contender. You all should send me some mailbag questions for tomorrow. There’s a chance I could run out of fake questions some time in the near future. It’s a very slight chance, but a chance nonetheless.